I've been reviewing a laptop bags and cases on the Mac Web for more than 10 years, and throughout that time (and longer), Targus has been the biggest player in the category, with the term "Targus Case" almost a generic. 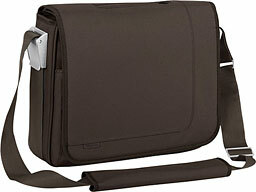 Today, Targus offers a vast array of different laptop case models (as well as an excellent and innovative line of laptop accessories, some specifically Mac-oriented), and one of the marquee models in their Fall 2008 selection is the Velos Messenger Laptop Case, an intelligently and thoughtfully designed messenger bag whose functional practicality involves no compromise in looks and flair. The Velos Messenger Case's distinctive styling feature is that it is designed to provide two distinct looks with one case, so it comes with a pair of alternate shoulder straps: one in an avant garde contrasting color and the other matching the case. The straps are easy to switch - just unlock the closures on each side of the bag to release the strap, insert the other strap, and then lock the closures back into place. 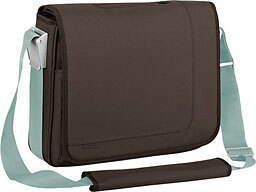 The case body skin fabric is a durable and attractive polyester twill in a variety of color combinations. The test unit arrived in a rich chocolate shade, with the default contrasting strap in aqua, which also happens to be Targus' new color scheme motif for its packaging. It's not a color combo that would've occurred to me off the top of my head, but it works, and I think it looks great, giving the the Velos case a distinctive and strikingly jaunty, but still tastefully elegant, appearance without being overstated. However, if you prefer a more subdued and conservative look, a second shoulder strap is provided in matching chocolate brown. You can also purchase different shoulder straps separately if you desire a greater selection of color themes for your Velos case. Available color combinations include our chocolate case with chocolate and aqua straps; a charcoal case with black and lime green straps; and a wheat case with mushroom and orange straps. Turning to the practical details, the Velos case's outside front has large fold-over closure flap with an asymmetrical, double-layered styling motif. 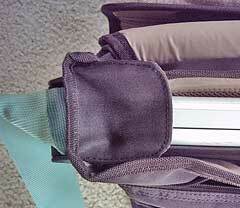 The back of the case is a full-width slip pocket with a central Velcro™ closure patch that can be used to carry papers, file folders, magazines, and so forth. 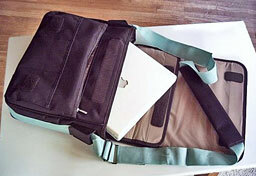 The Velos Messenger Laptop Case can accommodate pretty well any laptop up to 15.4" widescreen models, which covers the entire Apple portable spectrum except for the 17" MacBook Pro and PowerBook. Still on the outside, that shoulder strap isn't only a fashion accent; it's also very strong, being made of 2" nylon webbing and girdling the perimeter of the case on three sides, which should prove extremely secure and very durable. 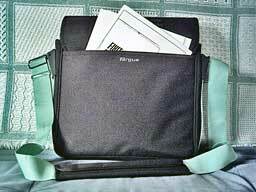 The strap is adaptable for length and has a Velcro-fastened movable shoulder pad for comfort. You can also tuck the strap inside the case's flap and carry the Velos briefcase-style with its retractable handle that recedes flush against the top of the case when not in use. Neat and convenient, but I did find the carry-handle to be not especially comfortable, being flat with fairly hard edges, and the elastic that retracts the handle is a bit stiff. The handle is accessed through an open aperture in the closure flap that tends to chafe your knuckles. It's a question of a clean, uncluttered appearance vs. functional comfort, and a tradeoff whose justification will depend on how much you use briefcase mode and, I suppose, how large your hands are, but it is my least favorite Velos case feature, and an atypical exception to what is otherwise a superb design. Moving inside the case, the aforementioned fold-over flap is padded with what feels like a thin layer of closed-cell foam and faced on its inner surface with a smooth nylon taffeta material in contrasting color - medium beige on our review unit. 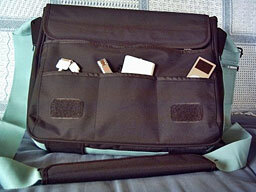 With the flap open and folded back, you find three open pockets on the lower half of the case body's front face, ideal for carrying cables, hubs, an iPod or iPhone, and possibly a laptop mouse. Immediately behind these open pockets is a full-width, zipper closure accessory pocket, also lined with contrasting-shade nylon taffeta and with a couple of handy inner pockets for business cards - a thoughtful touch. This pocket is big enough to handle larger peripherals and small (or even not so small) books, and so forth, and it's still just an outside pocket, so to speak. The cavernous interior of the main case is accessed by opening a second inner fold-over flap, which has a hefty Velcro-closure patch measuring about 8" x 1.5", which should be very secure. The computer compartment is at the back of the case, padded with a thick layer of foam behind two mesh fabric panels and separated from the rest of the inner compartment with a "sling" of what feels like "wetsuit" type Neoprene material. The second, frontmost inner compartment is the full width and depth of the case, protected at the front and sides with foam padding and also lined with nylon taffeta. It is very commodious - indeed, it's big enough carry a second laptop in this compartment quite easily if you ever had occasion to. An interesting and practical design touch is "rain flaps" at the outer ends of the inner compartment to help prevent protect against water and dust ingress. The Velos messenger case is more than versatile enough to look appropriately smart in both campus lounges and corporate offices, and it is an excellent, modestly priced suggestion for 'Book users on your Christmas list. Quality of materials and workmanship are first-rate, as one has come to expect from Targus products, and notwithstanding my gripe about the briefcase handle design, I have no hesitation giving this case a four-out-of-four rating. 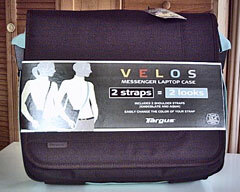 The Velos Messenger can accommodate laptops measuring up to 14.33" x 1.69" x 11.81", measures 14.57" x 3.54" x 12.01", weighs 3.17 pounds, and has an estimated street price of $69.99.